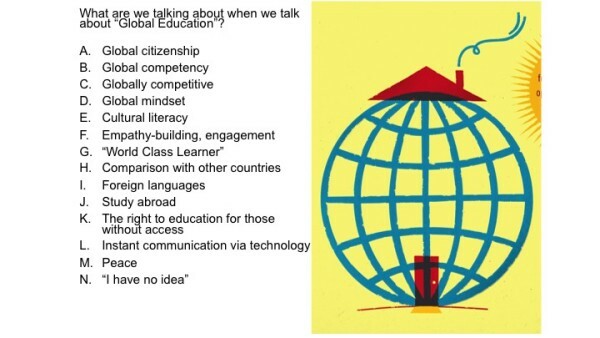 What do we talk about when we talk about global education? My list might have gone longer if I had more room on the slide, but I think it conveys the challenge that “global education evangelists” like me face, particularly when we work with people who don’t naturally gravitate to this topic (i.e., most people). Earlier, I presented at another conference attended by school leaders. Keynotes covered issues like self-care and assessment. For my featured breakout on connecting one’s passions to strategies for implementing global education, about twelve people attended. Next door, a session on discipline techniques was overflowing and participants came to borrow chairs from our room. When the conference concluded, I hung around to talk with people about their impression of the meaning and need for global education. Their numerous and disparate answers made me realize: 1) If there’s confusion on what the topic is about, then it’s hard to reach consensus for action or gain interest or buy-in; 2) if the idea seems too big and unwieldy this creates a sort of paralysis; and 3) if global education doesn’t seem personal enough to most people, then it doesn’t matter amidst so many competing interests. These points raised key questions: How can we better communicate the issue to attract a larger audience? How can we better connect with educators who already have so much on their plate that global education doesn’t seem urgent enough to them? And ultimately, how can we show how global education really DOES MATTER?! This result fascinated me since the baseline assumption is that successful people need to be “navigating an increasing complex world“—for which global education is at the core together with creativity. This requires qualities like collaboration, entrepreneurial thinking (being alert to possibilities so that you can address them using creativity), empathy, and deeper problem-solving—in short, a global mindset. Further, we are increasingly preparing students for jobs that haven’t even been invented. If we step back to think about our role as educators amidst such uncertainty, then building those mindsets that will allow our students to navigate change seems crucial—exactly the quality the CEOs from the IBM survey identified, and exactly what we mean by a global education. As global education evangelists, we need to convey clearly how global education is personal and relevant—and ties in to concerns about assessment, motivation, creativity, equity, and of course, college and career readiness. It might seem “big” but it need not be complicated. Simplifying, personalizing, and accepting diverse approaches to global education also makes it accessible to more students. Every child deserves a global education. From whatever angle or definition you approach global education, the most important thing is to take a step. Try something new, learn from it, and keep trying. Meaningful connections don’t just make us more globally competent; according to positive psychology, they make us happier. The list of resources you can tap into is long. Getting Smart recently posted this terrific inventory of 365 Global Innovators, Networks, Resources, and Champions, including the superb, online Global Education Conference, which is happening now. And if that list feels too overwhelming, reach out to me or anyone on the list. Each of us feels passionately that global education can and must be integrated into all our 21st-century learning—and after all, isn’t all the learning we do now 21st century, and indeed, global? At the same time, while this view of the whole, wide world feels so big and far-away, it’s intimate; and to stick, it’s ultimately a matter of the heart embracing our connectedness. When thinking about global education, it helps to convey this idea of the interplay of macro and micro, or global and local, big-picture and super-intimate that operate simultaneously in a process of becoming global citizens—embracing all there is to the many angles of what we talk about when we talk about global education. 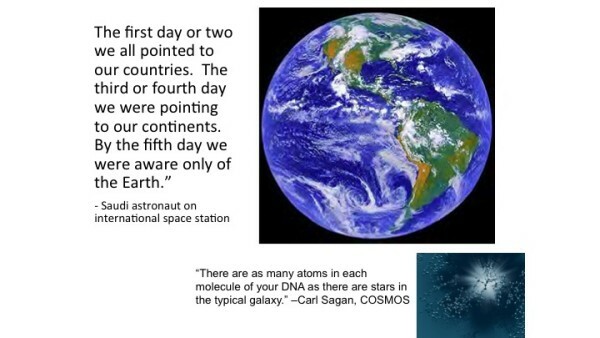 So, just take a step toward global education, in any of its many forms. There isn’t just one right answer.